At RSPCA NSW, we believe education is key to preventing animal cruelty. If we can teach people how to identify and stop cruelty in the first place, we will reduce the number of animals who need our help and, we hope, eliminate animal abuse. 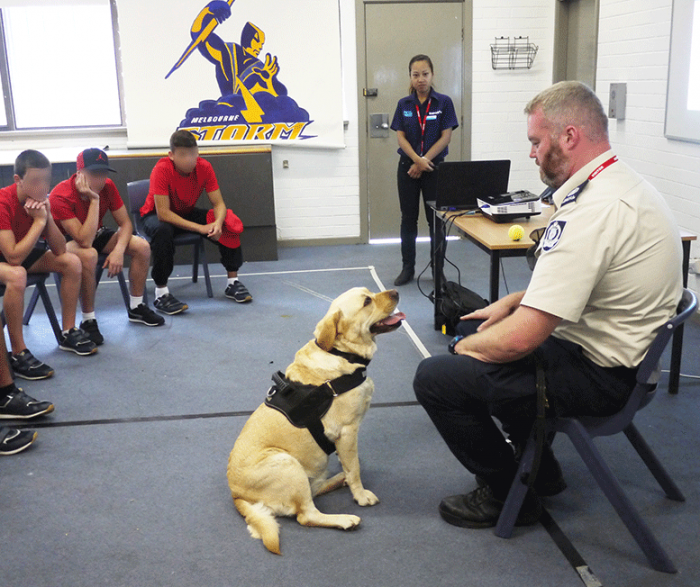 With this in mind, RSPCA NSW educators regularly visit juvenile detention centres across the state to teach the inmates about RSPCA NSW and how they can make a positive difference to the lives of animals. Some of the young men, meeting Bambi. Each presentation is tailored to the ages of the juveniles and dependant on their engagement with the session. But the Education Team is always sure to tell the participants about RSPCA NSW and our role in the community. They discuss the issues surrounding animal welfare, including defining what the term ‘cruelty’ means. They also teach them to recognise and act when they see cruelty occurring, and tell them about the law and the penalties involved if this is broken. 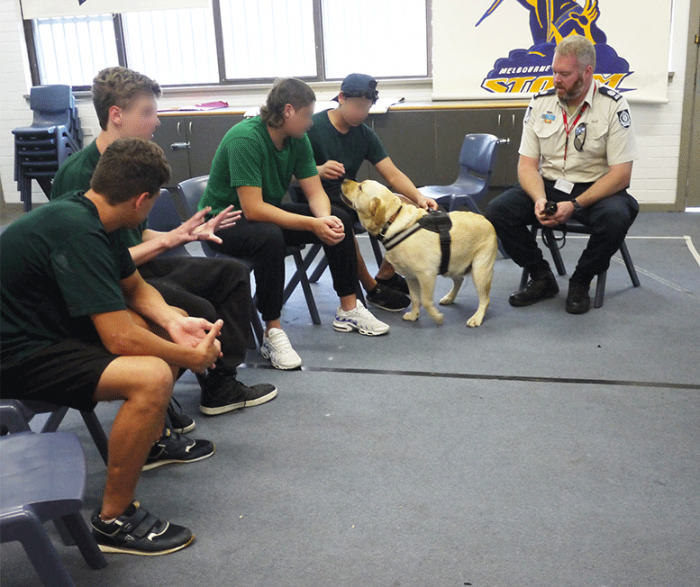 During visits to Cobham Juvenile Justice Centre, Inspector James spoke about animal cruelty, leaving many of the young men outraged at hearing about the types of mistreatment that is inflicted on animals. Education Manager Steph told the inmates about the reasons why people relinquish or surrender their pets to RSPCA NSW. And Training Officer Tazzi, aided by her fantastic dog Tusk, discussed animal behaviour, focusing on how to interact with animals safely. The team also encouraged the participants to report cruelty and stressed the importance of not putting themselves in harm’s way. Bambi the Labrador getting lots of pats. James talked to the female inmates at the Juniperina Juvenile Justice Centre about his role as an inspector and the cruelty cases he had brought to justice. He was accompanied by his beautiful Labrador Bambi, who inspectors saved along with another dog, Baxter. Meeting the dog behind the rescue story was a significant moment for the young offenders. Tazzi used a video to aid her demonstration on the importance of reading dog body language. Several participants expressed interest in becoming animal foster carers and volunteering for RSPCA NSW when they could, which was great news for the Education Team. 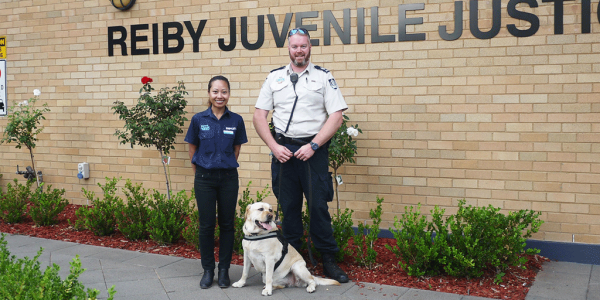 At the sessions at Reiby Juvenile Justice Centre, Steph discussed the reasons why RSPCA takes in so many animals and spoke about the RSPCA’s Help Us Close Puppy Factories campaign. The inmates were surprised to learn of the detrimental effects humans have had on dogs by breeding them to obtain purebreds. The Education Team was also happy to hear many of the participants said they would like to work with animals in the future. Inspector James with his dog, Bambi. It’s not just juveniles whom the Education Team visits. 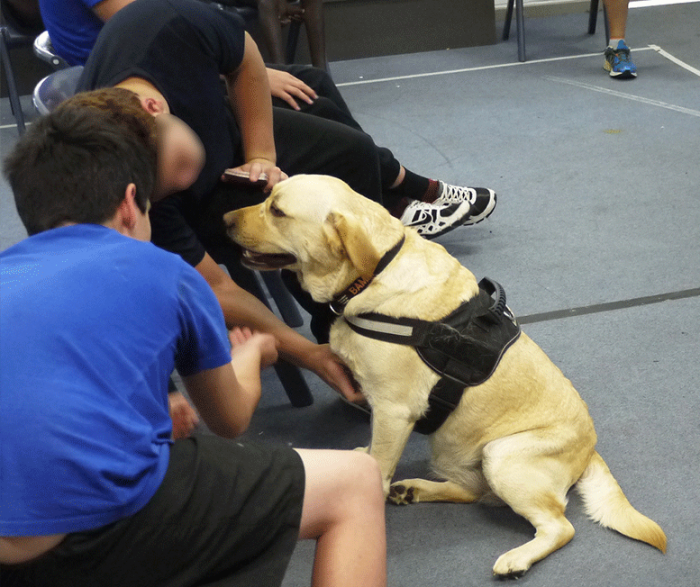 RSPCA NSW also presents workshops to before and after school care groups, community and corporate groups, early learning centres, Girl Guides and Scouts, primary and high schools, and universities. If you would like the Education Team to speak to you, please click here to get in touch.